Big Questions Day – As part of our Religious and Moral Education programme we encourage to our pupils to consider and think about major issues and develop critical thinking skills understanding where their own beliefs come from. This can be challenging for some but rewarding for those who take part. On Thursday 28th November S5/6 pupils welcomed representatives from the local churches to spend a day with them thinking about ‘big’ moral questions. The theme was: The value of a human being. After an introductory session looking at the value of different occupations and then gauging opinions on a range of philosophical questions, the main focus of the day moved to the issue of voluntary euthanasia. The group worked in teams to identify the key arguments on both sides of the debate in preparation for what turned into a very lively discussion on whether or not assisted suicide should be legalised (as it is in several European countries). Pupils also had a chance to explore the answers to some of their questions on a wide range of philosophical issues with the visitors before the end of the day. This was a good opportunity for pupils to think through and to develop their own views and opinions, by talking about them and by listening to the views of their peers, and they participated with enthusiasm and maturity. We are grateful to our guests who were able to discuss these issues without bias whilst making it clear that their opinions were based on their own beliefs. Feedback from S5 and S6 pupils taking part was very positive and on that basis this was one of the most successful events that we have organised in school this session! Thanks to Mrs MacRae for arranging this for a second year in succession. Comenius Project 2013-2015 – The High School has, for the second time, been successful in applying for funding for a Comenius Project. The Project title is “The Four Natural Elements and their impact on our lives”, and the countries involved are Latvia, Portugal, Poland, Greece, Turkey, Finland, Spain and Scotland. As in the last project, pupils and staff from Gairloch High School will travel to each of these countries, making presentations on their research of the Project. In addition, they will sample life in other European schools and communities, as well as experiencing the contrasting cultures; also on the agenda will be a great deal of “making friends” and “having fun”! In November, Ms. Hunter and Ms. Dean accompanied pupils Becky Griggs and Innis Taylor to Latvia. After a few days in the capital city, Riga, they went to the Comenius school of Preili, where they met their hosts for the week. The trip was filled with many different experiences, including architecture, history, crafts, music and dance. All had a wonderful week, and look forward to sharing photos and films with the school and the general public in the near future. The next trip is in January, when pupils Sara Johnston, Eilidh Johnston and Caitlin Mitchell will travel to Oporto in Portugal. Gairloch High School and Gaelic Resource – Mòran taing (many thanks) to Gairloch High School students and their teacher who took up the challenge to translate the John Muir Award certificate cover letter into Gaelic. This accompanies the existing Record Books, and John Muir Discovery Award Certificates that are currently available as a Gaelic resource. 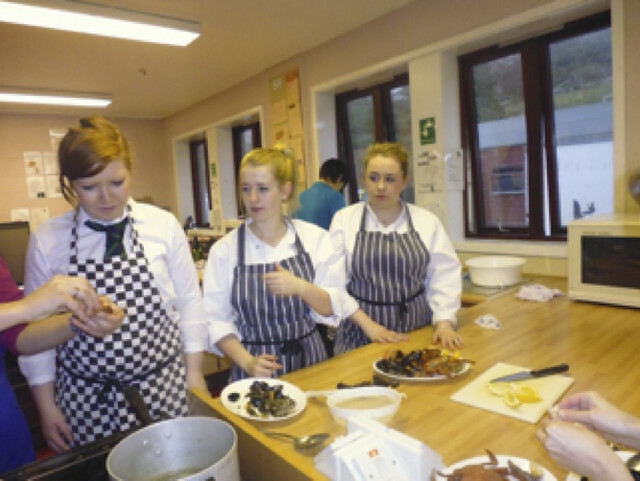 Seafood Cookery Course – The High School played host to the Seafood and Shellfish cookery course on Monday with local people and Professional Cookery seniors taking part in the two-hour event, led by Jess Dodds of Dry Island Shellfish. The pupils and other participants had the chance to prepare a variety of seafood including crabs, squat lobsters mussels and made a delicious Thai Fish Curry. The event was arranged by Susan MacLean of West Highland College and the school for the provided the use of the Home Economics room for the morning. 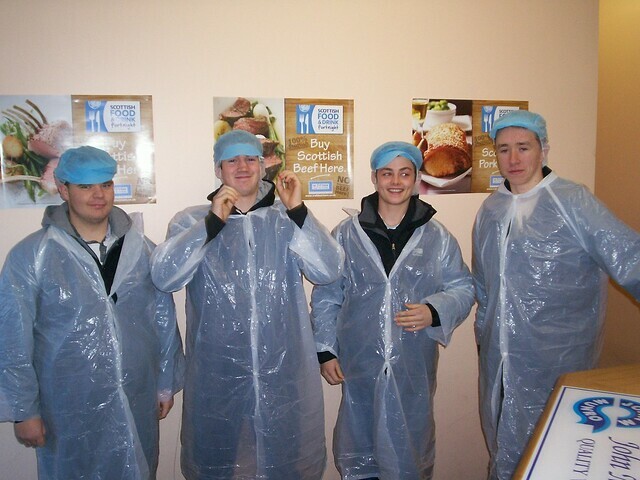 S5 Visit to Munro Slaughterhouse – On Thursday the 14th November our Rural Skills class (Neil, John, Jake and Ross) went to the abattoir in Dingwall to find out how the business works and to see where all our meat comes from. Here is their report: When we arrived John Munro met us and he showed us round the premises. We looked at the penning area, slaughter room and freezers where meat is hung and ready for cutting or packing. We were shown animals being killed, butchered and packed ready for selling. Each week 150 sheep, 100 cows and 50 pigs are slaughtered for market or for private use. When Cattle get sent to the abattoir they come with a passport and that has their ear tag on it, farm number, gender and breed of cattle. They also have passports for things like disease control and so it maintains consumer confidence. In this trade there is a four-year apprenticeship to become a slaughter man or a butcher. Important Dates – As we progress through December check the school website for important dates. Study club has been running after school three days a week for three weeks. Prelims for S4/5/6 pupils start on the 14th January! The School Dance is on Friday 13th December. Christmas Wishes – Everyone at the school wishes a happy and festive Christmas to everyone in the community with best wishes for the New Year. Malawi Reports – The pupils who visited our partner school have been providing talks and feedback in the form of presentations to others in the community. Kalvin Fraser spoke to the ATC, while Eilidh Maclennan, Beth Townsend and Luke Gorman prepared food and spoke to the Youth Fellowship. Pupils have also been visiting classes in school and answering questions after handing out letters and photo from pen-pals. Over the next few weeks the team will visit all of our associated Primary Schools. Everyone is invited to the school on the evening of Tuesday 10th December at 7pm to share our stories. The second part of our news report from the pupils is available here on our pages dedicated to the Project. Comenius Trip to Latvia – Becky Griggs and Innis Taylor have returned from a successful trip to Latvia. Accompanied by Miss Dean and Miss Hunter we expect a report in the next issue. The next trip takes place in January when some of our pupils will travel to Portugal. Highland Young Musicians – On Saturday 23rd November 9 of our pupils took part in variousconcert performances at the McDonald Conference Centre in Aviemore. The event was well attended and the performances were truly magical. First on at 2.30pm was Nessie Gearing (S6) in the Highland Schools Wind Band playing trumpet. At 3.10pm Megan Copland (S3) and Eilidh Owens (S5) sang a range of songs in Gaelic as members of Còisir G. This was followed by some wonderful big band music from Highland Youth Big Band including our own Oscar Howard (S5). At 5.40pm Leonie Baptist (S2) and Hannah Wood (S2) tackled some difficult pieces (including Barber’s Adagio for Strings) as part of the Highland Youth String Orchestra. Next followed a very professional performance from SNAS. Folk music to dance to by enthusiastic young people that included Becky Griggs (S6) on fiddle and Luke Gorman (S6) on keyboard. Finally Nessie (trumpet) joined Freya Baptist (S4/violin) in the Highland Regional Youth Orchestra performing Elgar and Tchaikovsky. A wonderful day of music that showcased some exceptional talent from Highland that included a good number of young people from Gairloch. 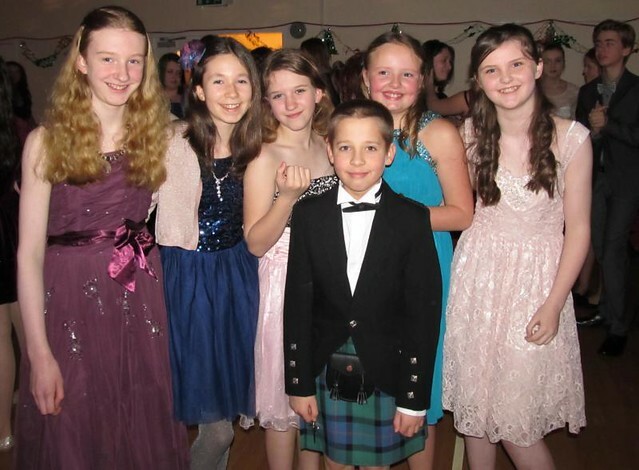 Click here to see the official photos from the Aviemore concert. Basketball National Schools’ Cup – The school hosted the Nicolson Institute (Stornoway) last Friday for U14 and open boys’ basketball games, as part of the National Schools’ Cup. The U14 game was a nail biter, with a two-point lead switching throughout the last quarter. 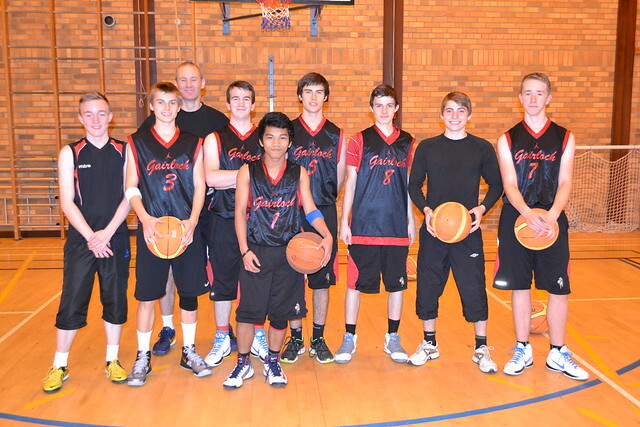 Unfortunately, Gairloch lost at the end 40 – 42. Well done to the team for keeping us entertained. The open boys put in a strong performance, winning 42 – 75. We’ve been working on organisation and structure and it really paid off. Thanks to John Kerray, regional development officer and Kevin Peat for helping with refereeing. Most of all, thanks to the Nicolson Institute for taking the trouble to come over on a rough day! New Strips – Both our teams will be entering the Highland Schools’ League in the new term. The boys need new strips, with the U14s having outgrown theirs and the seniors using second hand ones with not enough to go round. If anyone is able to support us in the purchase of new strips, please contact Mr Johnston at the school. Charities – On Friday 15th November, pupils (and staff!) had a chance to wear pyjamas to school to raise money for the BBC Children in Need Appeal. 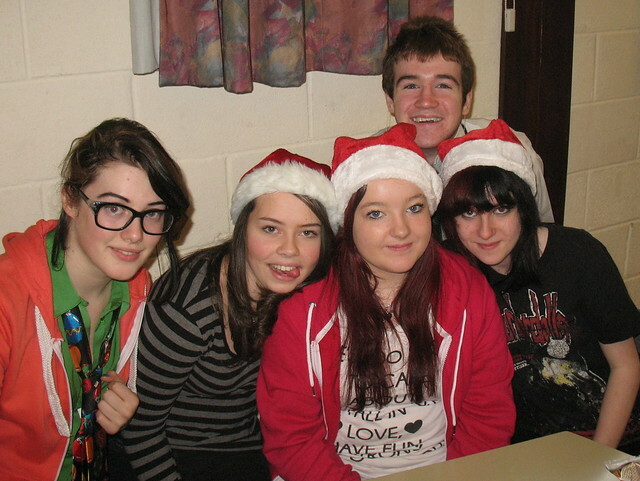 A cake sale was also organised at interval by senior pupils – always popular. A total of £376.66, which included a £10 donation from Poolewe Nursery, was raised. Well done to all who helped to organise this event and thanks to everyone who contributed. 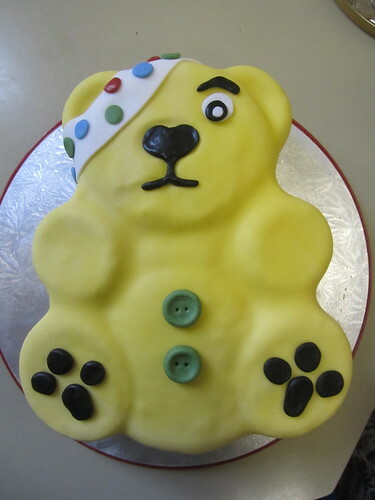 Particular thanks to Catherine Wyatt and Miss MacAllister: Catherine baked a magnificent Pudsey Bear cake to guess the weight which was won by Miss MacAllister, who then had it cut up and slices sold for further fund raising. A special mention also to Jasmine Connop in S2 who raised money earlier in the week by managing a day’s sponsored silence whilst at school. Turas Sabhal Mòr Ostaig – Air an 13mh den t-Samhain, shiubhail seachdnar sgoilearan sa chòigeamh san t-seasamh bhliadhna dha Sabhal Mòr Ostaig,’s ùidh againn ann a bhith a’ cumail a’ dol le foghlam Gàidhlig as dèidh dhuinn an sgoil fhàgail. Dh’fhàg sinn an sgoil aig leth uair an dèidh ochd sa mhadainn, is ràinig sinn Sabhal Mòr Ostaig mu chairteal gu aon uair deug. Bha sgoiltean eile an sin cuideachd, Acadamaidh Inbhir Pheofharain is Sgoil a’ Phluic nam measg. Ghabh sinn pàirt ann am bùth-obrach dràma, is an uair sin dh’èist sinn ri taisbeanadh, a bha ag innse dhuinn beagan mu dheidhinn na cùrsaichean a tha iad a’ tairgse. As dèidh diathad a bha an-asgaidh on cholaiste, bha sinn air ar toirt mun cuairt an toglaich, is sinn air ar cur ann am buidheannan de dhaoine a bha fileanta as a’ Ghàidhlig, is feadhainn a bha ag ionnsachadh. Bha cothrom againn àite-fuirich nan oileanach fhaicinn, is an uair sin b’ urrainn dhuinn ceistean a chur air daoine a tha a’ rannsachadh aig a’ cholaiste an-dràsta. As dèidh sin, rinn sinn ar slighe air ais dhachaigh. Ràinig sinn an sgoil aig còig uairean. ‘S e là inntinneach a bh’ ann, ged a bha an t-slighe an sin gu math fada. As dèidh an turais, tha cuid nas cinntiche gur ann dha Sabhal Mòr Ostaig a tha iad airson falbh as dèidh sgoil, is tha cuid eile cuideachd a’ smaointinn gur dòcha nach e an suidheachadh a b’ fheàrr a th’ ann dhaibhsan. Mòran taing do Andy, an dorsair, a thug an sin sinn. Art Exhibition and 2014 Calendar – The exhibition at the GALE Centre opened last week and shows the work of pupils doing Art in the School. The exhibition continues and is worth a visit. Calendars are available from the school office priced £6. Please support school funds by ordering copies for friends and family. 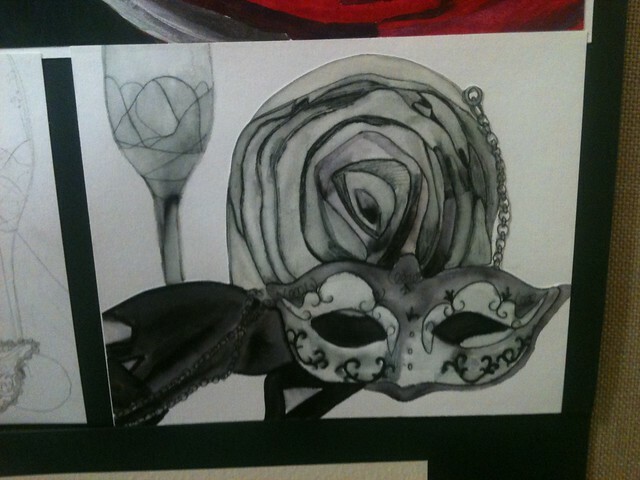 Thanks to Mrs Caroline Browne and her pupils for providing such creative work both as part of the exhibition and for the calendar. Click on the photo to see more photos of the event. Important Dates – As we progress through December check the school website for important dates. The School Dance is on Friday 13th December!